The volume’s front cover features a needle-painted portrait of the young prince Charles Stuart. The ship on the back cover may be the Prince Royal. 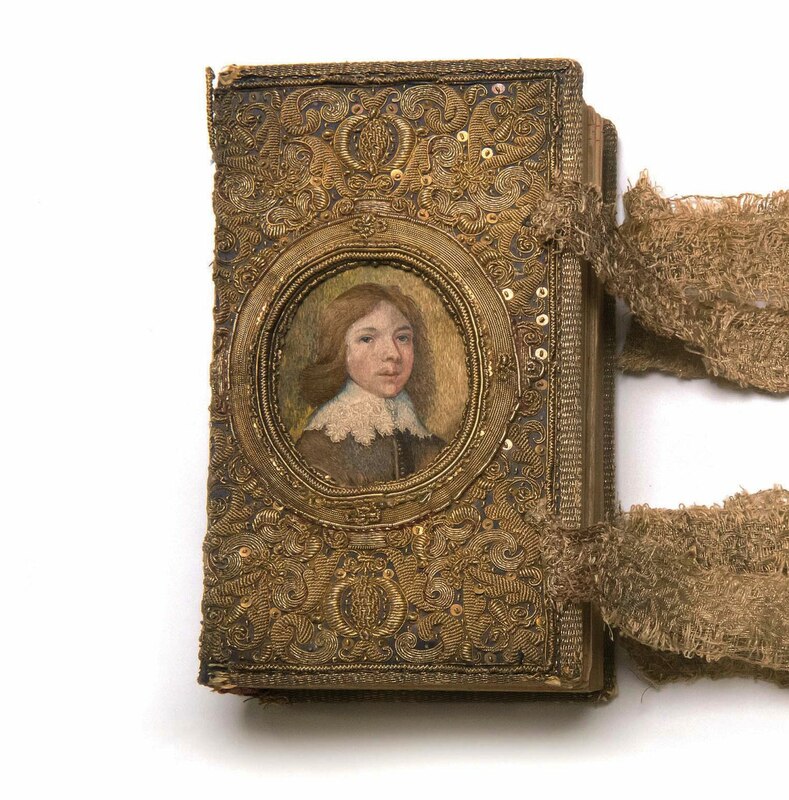 The ornately embroidered cover was protected within this gilt-tooled, book-shaped leather box. When we arrived at Houghton Library to study its collection of embroidered book bindings, we were prepared for a bit of a treasure hunt. Such bindings have not received much attention, but as needlework historians, we are used to doing research with little advance information. 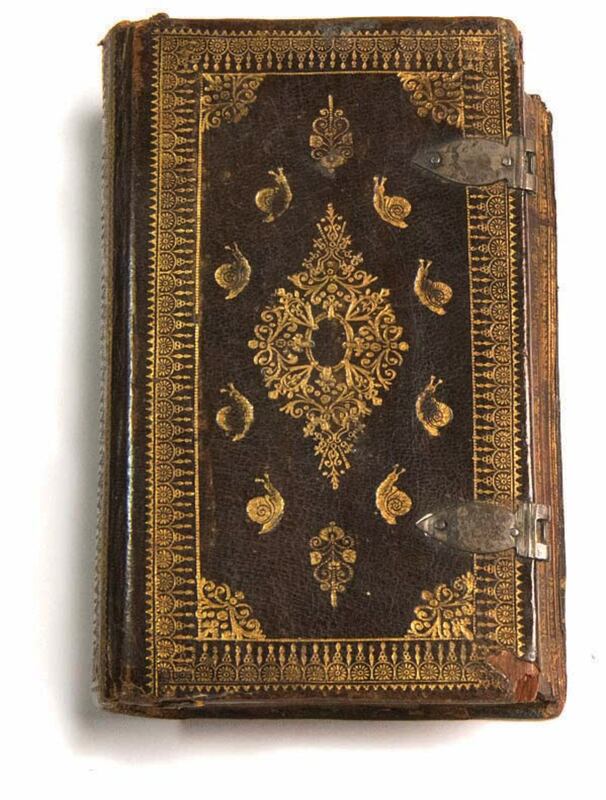 Embroidered book bindings reached the peak of their popularity between 1550 and 1650. Made both professionally and domestically, these precious objects are relatively rare. They typically covered devotional texts such as psalters and bibles and were handled daily, causing them to fall apart with wear. Embroidered books were also an integral part of the gift-giving culture, imparting a sense of respect and engendering gratitude and patronage. When we called up item WKR 12.4.8, described as an embroidered book, we were taken aback: what we were handed was a leather-bound book with no needlework. Though disappointed, we dutifully documented our observations of the beautiful gilt tooling and delicate clasps. But as we handled and photographed the volume, we realized we had a box cleverly wrought to look like a book. When we gently released the clasp and lifted the lid, our appreciative gasp was so audible in the reading room that other scholars came over to inquire, “What have you found?” The opened box revealed a real treasure: a book from the 1640s professionally embroidered with elaborate gold needlework. Our hunt had yielded a presentation Bible gifted to Prince Charles Stuart, later Charles II. 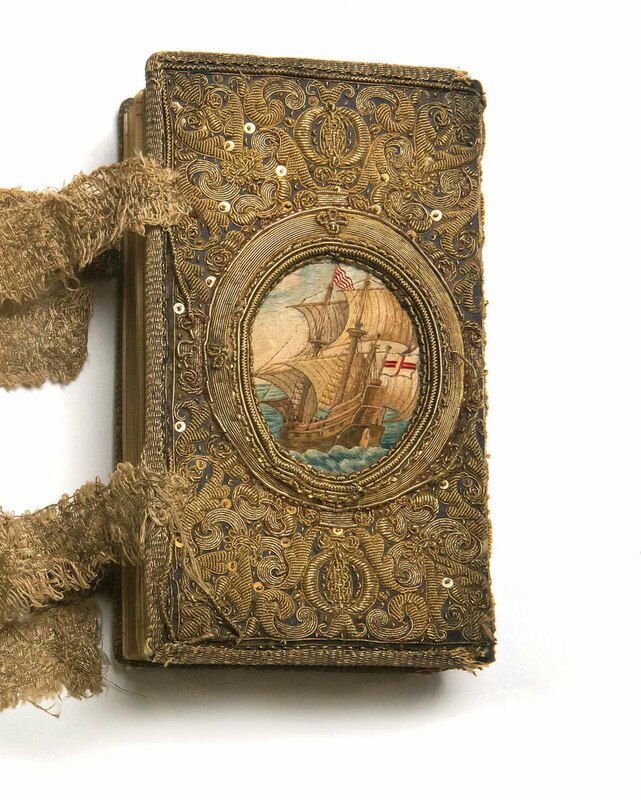 The book itself is in remarkably fine condition: a petite 7 by 4 inches covered with an intricate design worked in silver gilt thread (a silk core wrapped in silver that has been dipped in gold) and embellished with spangles. The needlepainted image of Charles is still vibrant and exquisitely detailed (note the delicate lace collar). The ship on the back cover may be the Prince Royal, which was rebuilt in 1641. We can date this piece to 1644-1646. The printer’s mark on the frontispiece shows a printing date of 1644 and the exact fit of the embroidery indicates it was made specifically for this Bible. The image of Charles is strikingly similar to a painting by William Dobson dated 1642 or 1643, when the prince would have been 13; the portrait on the book shows a young man of the same age. Judging by the minimal wear, this princely gift was rarely handled after its initial presentation and was either stored or regifted—a common practice even then.